Homemade pumpkin pie made from scratch with real ingredients, no canned pumpkin! Perfect for the holidays! Just like Gramma use to make! 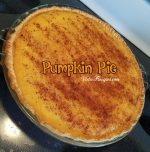 REAL pumpkin pie made with real ingredients! Tastes amazing after a turkey dinner! Thanks to Amanda Stortz for this recipe! Beat all ingredients together and pour into pie shells. Bake at 400 F for 35-40 minutes.